It’s 2019, and there’s no argument that social media is one of the most important marketing platforms at your disposal. But keeping up with social media posts can be a struggle. Why? Social media is always on. Your audience is global, and you need to be posting 24/7 to reach them. Luckily, it’s 2019, and there are a gazillion amazing services at your fingertips that can help you automate the posting process. But which one to choose? You need the support of a great tool, and Buffer and Hootsuite are two of the best. 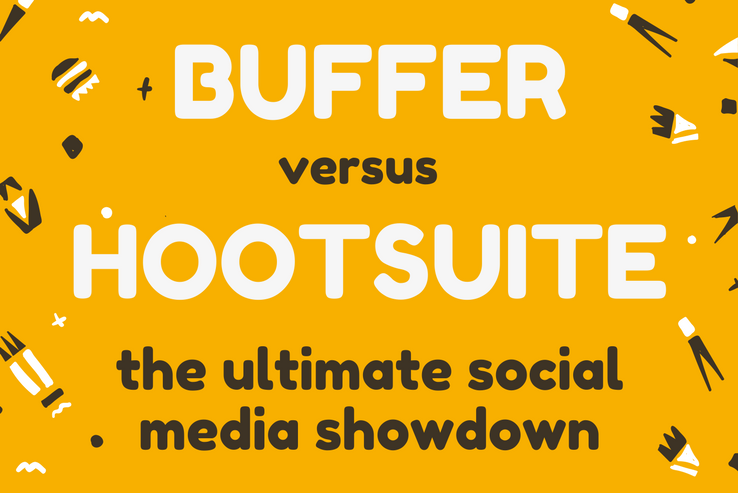 We’re about to hold the ultimate social media showdown – Buffer vs. Hootsuite. Which one will take the prize? But first, there’s one big difference between Buffer and Hootsuite – Buffer is a content publishing tool, while Hootsuite is a full featured social media management tool. By definition, Hootsuite has more features than Buffer; however, to be fair this article will only compare its ability as a social media content scheduler. So, how do Buffer and Hootsuite compare? Buffer was started in 2010. It started lean. CEO Joel Gascoigne tested his idea for Buffer with a landing page and collected sign-ups to gauge interest. When it became clear that there was interest in the product, he created the first version of Buffer in 7 weeks. Initially, Buffer had limited features and served Twitter only. As the company has grown, other social media platforms have been added and more features have been introduced. Hootsuite began in 2008 when Ryan Holmes felt the need for a tool to manage multiple social media channels. Hootsuite now boasts over 15 million active users and serves more than 800 of the Fortune 1,000 companies. Hootsuite is a powerful tool that’s far more than just a content publisher. While you can schedule your posts with Hootsuite, you can also monitor feeds for mentions of your brand, respond to posts, and engage with your audience. All from within Hootsuite. Which social platforms are supported? Buffer supports Pinterest, Twitter, Facebook, Instagram, LinkedIn, and Google +. Hootsuite supports YouTube, Twitter, Facebook, Instagram, LinkedIn, Google +, and WordPress. Most notably, Hootsuite doesn’t support Pinterest. If you want to schedule posts to Pinterest, you’ll need to choose Buffer or use a Pinterest-specific scheduler like Tailwind or BoardBooster. If you want to publish content around the clock, you need to schedule those posts or be chained to your computer. How do Buffer and Hootsuite compare at scheduling? Buffer is designed specifically to schedule your social media posts to your social media accounts. You can set your preferred schedule or allow Buffer to automatically build your schedule based on their algorithm for optimal performance. With a paid Buffer plan, you can also link RSS feeds to your account so that whenever a new post appears in the feed it’s automatically added to your Buffer queue. One drawback of Buffer is the limit placed on how many posts you can have scheduled in advance. For the free plan, you can only have 10 posts scheduled (per platform). If you upgrade to the Awesome level plan, you can have up to 100 posts scheduled per platform. Hootsuite allows you to publish content in real-time or schedule posts in advance. Like Buffer, you can set your own schedule or let Hootsuite choose it for you. Also like Buffer, you can link RSS feeds to your account so that you have a constant stream of fresh content automatically queuing in your feed. Unlike Buffer, Hootsuite has no restriction on the number of posts in your queue. Hootsuite. Both Buffer and Hootsuite are equally capable of scheduling your posts, however, Buffer’s queue limit means that Hootsuite has the edge when it comes to scheduling. Analytics are critically important if you want to measure your success on social media. How do Buffer and Hootsuite compare? Buffer provides basic analytics on its free and Awesome plans. Because Buffer is a content publishing tool, analytics are based on content performance. You can see how well your posts performed as well as your top-performing content. Hootsuite analytics are a little different to Buffer’s. Hootsuite is a social management platform, which means that its analytics are based on overall social media account performance rather than content performance. Some features of Hootsuite analytics include being able to track your follower count and your team response time. Hootsuite. Hootsuite’s analytics are more extensive than Buffer’s and give you a better picture of the state of your social media account. Both Buffer and Hootsuite integrate with various plugins and apps. Let’s see how they compare. Buffer integrates with many social sharing plugins and has its own browser extension. You can see the long list of apps that it integrates with here. Add your Instagram images to your Buffer queue to be posted on Twitter. Add new blog posts from your blog to your Buffer queue. Add your Tweets to your Buffer to be posted on Facebook. There are over 1,800 different applets to experiment with. Hootsuite has a browser extension called Hootlet. Using Hootlet allows you to queue content on the go. The ability to search your social media archive. Send posts to your Slack channel. Share your MailChimp email marketing campaigns and view results from within your Hootsuite dashboard. There are 169 apps. Some are free, while others are available at a price. Buffer. IFTTT gives Buffer far more flexibility and free integrations than Hootsuite. Starting to use a new tool can be intimidating. You don’t know where anything is and everything takes longer than it should. So, which tool comes out on top for user-friendliness? The difference between Buffer and Hootsuite is very apparent when it comes to user-friendliness. The core function of Buffer is simple – publish content and provide analytics on that content. Everything about the Buffer interface supports that goal and it’s quite user-friendly. On the other hand, Hootsuite is packed with features and functions that make it possible to manage the social media accounts of the biggest brands. Of necessity, Hootsuite’s interface is more complex. It’s not as user-friendly as Buffer’s interface. Buffer. It has a simpler interface than Hootsuite which makes it much easier to use. Buffer has a free forever plan that allows you to add one social profile per platform and schedule up to 10 posts at a time. Paid plans start at $10/month which allows you up to 10 social profiles and 100 scheduled posts. If you want more than that or access to more in-depth analytics, you’ll need to upgrade to Buffer for Business, starting at $99/month. Hootsuite has a basic account that’s free, however, paid plans start at $12.99/month (when billed annually) for a single user and up to 10 social profiles. 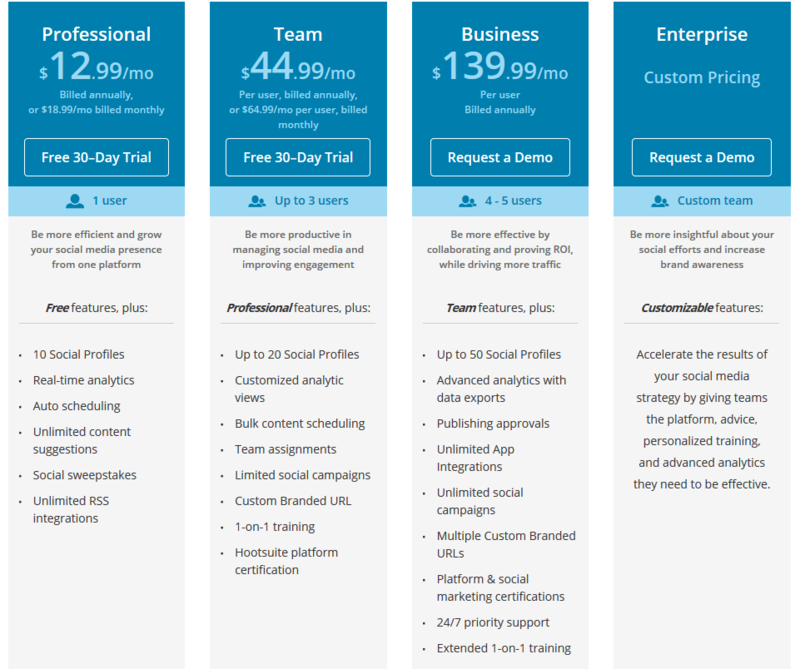 Plans for teams and businesses start at $44.99/month for up to 3 users and 20 social profiles. It’s a tie. 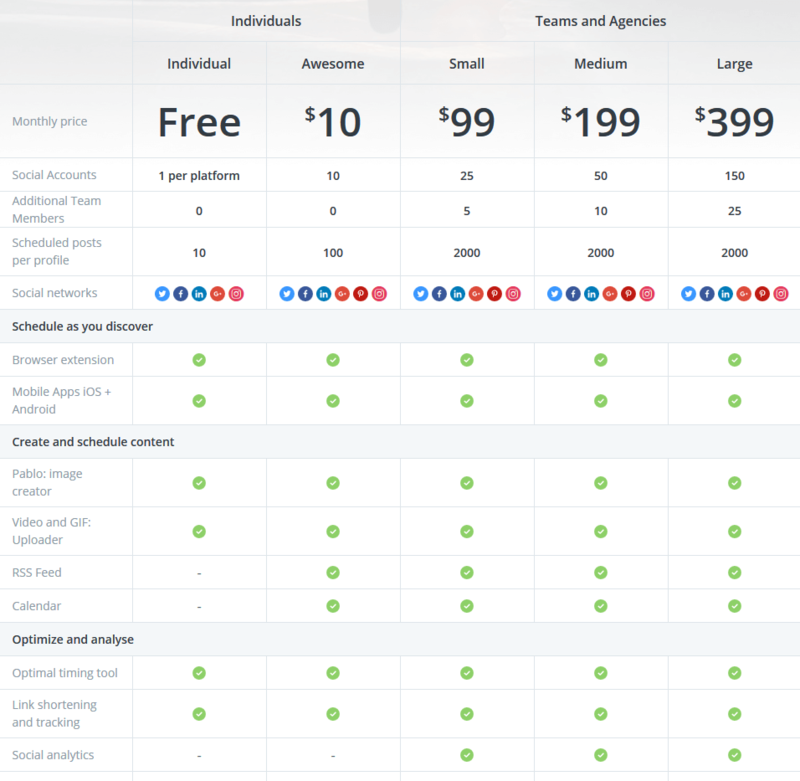 Buffer (if you’re a solo operator) is the better option as the Awesome plan is cheaper than Hootsuite’s Professional plan. However, if you’re running a business, Hootsuite’s Team and Business plan prices start much lower than Buffer’s Business plans. Scheduling Up to 10 posts per platform on the free plan and 100 posts per platform on the Awesome plan. Unlimited scheduled posts per platform on the free plan. Analytics Simple, based on content performance. Comprehensive, based on social media account as a whole. Integrations Social sharing plugins, Buffer browser extension, App integration, and an extensive set of IFTTT integrations. Hootlet browser extension, extensive app integrations. User-friendliness Clear, user-friendly interface. There’s a learning curve with Hootsuite as it’s a much more complex tool than Buffer. So, after all’s said and done, which tool came out on top? Buffer took the lead in integrations, user-friendliness, and price (for solo operators). And, Hootsuite came out on top in scheduling, analytics, and price (for businesses). It’s impossible to pick a clear winner because both are excellent tools. At the end of the day, which one you choose will depend on what social media platforms you’re scheduling to and if you need the robust features of a social media management platform rather than just a content publisher. Over to you – are you using a tool for your social media scheduling? Have you tried using Hootsuite or Buffer?